Tour Season begins on September, 16th. We will begin Booking Tours in August. All Tours Require a 10 person minimum. During the week we offer approximately a 30 to 60 minute tour with a price range of $1.50 to $7.00 per person depending on what your tour has signed up to do. Our Tours are available every hour on the hour beginning at 9:00 a.m. and running until 4:00 p.m. by reservation only! We have accessible and free parking for busses and a large picnic area available to you. Although your tour is only one hour long we encourage your group to stay as long as they would like. 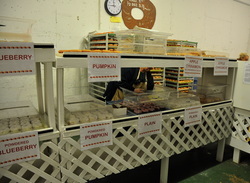 We have a wide selection of treats to chose from in our cider mill, donut shop and country store. Your group may also bring a picnic lunch and enjoy the day at the farm. VerHage's Fruit Farm and Cider Mill is a great place for a field trip or a great group activity for all ages and abilities. 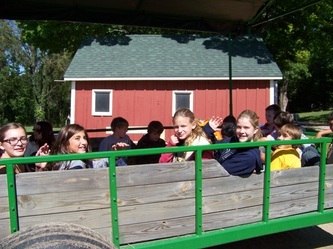 Our farm is handicap accessible, including our hayride! When we say every one can have fun here; we do mean everyone!! Don't Miss out on the Fun for Everyone! Call today to see what kind of Michigan Tradition you and your group can experience today! We are booking tours by phone right now, please call us today at (269) 375 - 0153. Introducing Build Your Own Tour! Through the years we have had our share of compliments, complaints and suggestions and we have now came up with build your own tour. Now we have put a price on everything in the tour and you and your group can now just choose what you want to do and what fits your budget! Tour price range is now from $1.50 to $7.00. You Choose & You Decide what works for your group and your budget! Your Tour experience can begin with . . .
A walk through Grandpa Vern's Aniamal Barn. Our animals are all friendly and are there for your viewing pleasure. You may pet the animals, but please remember that we do not have public handwashing facilites and during the tour you will be eating. These animals are well taken care of and are on display for you to enjoy. PLEASE NEVER FEED OUR ANIMALS for your safety and their health, they are fed on a very strict schedule. Early in the Season animals may not have arrived yet. Sorry. If Animals are available they are FREE to view. A Scenic Hay Ride . . . Your group can choose to embark on our scenic Hay Ride through our vintage orchards! The best part of this experience is that our Hay Ride is Handicap Accessible! Everyone can take a Hay Ride in your group! The Hay Ride lasts approximately 30 minutes. If you choose to add the Hay Ride to your tour it is $3.00 per person. 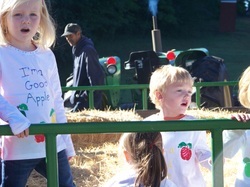 Your group can choose to pick one apple per person while visiting our orchard on the hayride. If you would like to add this to your tour the cost if $0.50 per person. Your group could also pick a bag of apples by the 1/2 peck, 1/2 peck, 1 peck and or 1/2 bushel and your group would be charged by the bag and its size chosen. Traditional Cider Making Demo . . . Your group can choose to fully experience our traditional cider making process. This demonstration is approximately 20 minutes long. Your group will be able to see and hear the demonstration from beginning to end! Your group will be able to sample cider straight from the press! If you choose to add this presentation and sampling to your presentation it's cost is $1.50 per person. For an additional cost of $1.50 your group can receive they're very own 1/2 pint of cider to take home or enjoy if you are extending your tour for a picnic lunch. WE DO NOT PASTEURIZE OUR CIDER! Our Cider is traditionally made with no additives or preservatives. We are regularly inspected by the state for the safety of consumption of a non-pasteurized product. If your group is not drinking cider . . .
- The Cost is the Same. - No substitute will be provided. Your group can choose to enter our donut shop where they will receive 1 donut per person from our tasty tour selection of homemade hot cake donuts! Everyone will have time to enjoy their yummy homemade donuts. As always your group may purchase any additional items to take home with them after the tour is complete. The Most Popular Tour includes . . . 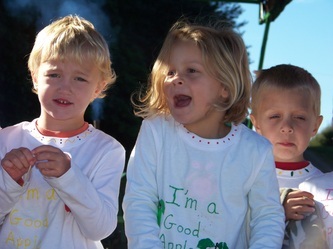 The most popular tour begins with a FREE walk through the Animal Barn, the Hay Ride where each person picks one apple per person, then arrive back at the Cider Mill for a Cider Demo and sample of cider and top the tour off with each person choosing a tour donut! This Tour is $5.50. Questions we will have for you . . .
1. What Day, Date & Time? *Monday - Friday 9 a.m. - 4 p.m. only on the hour. 2. What is your School or Groups Name? 3. What is your Name and Contact phone number? 4. How many people? Including everyone participating in the tour. 5. Does your group have Wheel Chairs or Special Needs? How many wheel chairs? Now what do you and your Tour want to do to fit your budget? 1. Does your group want to go on a Hay Ride? Cost = $3.00 per person. 2. 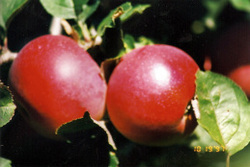 Does your Tour want to pick or select an apple? Cost = $0.50 per person. 3. 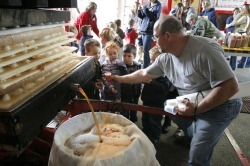 Does your group want to see the Cider Demo and Cider Sample off of the Press? The cost is $1.50 per person. 4. Does your group want to select one donut from the Tour Selection of Donuts in our Donut Room? ​ Cost = $0.50 per person. Important information you should know before booking a Tour! Reservations are required! Call 269 - 375 - 0153 to book a tour today! TOURS ARE AVAILABLE ON WEEK DAYS ONLY! We will need your group's name and address for booking information. A contact name and number for confirmation purposes. You must know your head count prior to your tour! We only book Tours on the Hour! Tours begin at 9a.m. Last tour is at 4p.m. WE DO NOT ACCEPT INDIVIDUAL PAYMENTS! Please have one check payable to VerHage Farms! Please arrive early! Free parking for busses! Large Picnic Area for extended visit! Dress for the Weather! This is out door activities! We are Handicap Accessible! Wheel Chairs Welcome! No Hand Washing Facilities, Porta Johns Only! To Book a Week Day Tour Call 269-375-0153 today!